If you’re looking to get into embroidering, then a general sewing machine won’t cut it. You would need a machine designed specifically for embroidering, or at least a combination of both sewing and embroidering. You would be surprised at what you could create with the right embroidery machine. Embroidering can certainly be much more challenging than sewing, but with a great machine made with the needs of embroiders in mind would make it much easier, fun and exciting. So without further, let’s find out what the best embroidery machines on the market have to offer. First things first, let us tell you that there’s a lot of misinformation about this embroidery machine. It has got a fair few negative reviews, but most of them have nothing to do with the machine, and are more about errors in the way it is set up. Yes, it can be a bit of a challenge to get used to this machine, as it does have a learning curve, but once you do take the time to understand how it works and learn to use it properly, you WILL be able to embroider like you may have never imagined. This is a beast of an embroidery machine and one of the most long-lasting ones you will ever come across. A customer mentioned how they have put 4 million stitches on this machine and it still works great. It’s a really advanced embroidery machine and offers a ton of value, so it’s actually not as expensive as it might seem initially. 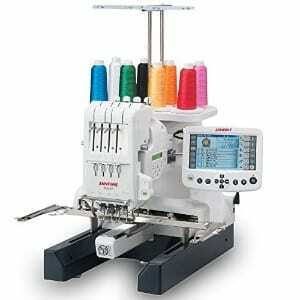 The Grand Slam package that consists of 64 embroidery threads should easily be worth a few hundred dollars. Then there are prewound bobbins, cap hoop, stabilizer, sock hoop, scissors, and 15000 embroidery designs. No matter how advanced the embroidery projects you’re working on are, you likely wouldn’t need to get anything and would be able to get started with it right away after getting this machine. If you compare embroidery machines, you will find this to be much reliable, as you will run into far less hiccups than most other options you will find on the market. Being the best embroidery machine it can also handle a lot of heavy duty stuff, so if you’re a professional embroider or plan to become one, this thing would turn out to be your best bet, as the many other embroidery machine reviews it got suggest. The advanced features and the huge amount of value it offers is what we really like about it. It makes professional embroidering much easier than it actually is, and offers a huge variety of embroidery designs along with the ability to create your own ones as well. As all those Brother embroidery machine reviews for this machine clearly mention, this is one of the best embroidery machines money can buy. If you’re wondering what is the best embroidery machine that you can buy on a budget, then the SINGER Quantum Stylist 9960 has to be it. The very first thing we would like to discuss in this embroidery machine review is the kind of power the Stylist 9960 brings to the table. A customer mentioned in their review how they were able to sew through 4 layers of vinyl, which is a very heavy embroidery and sewing fabric. 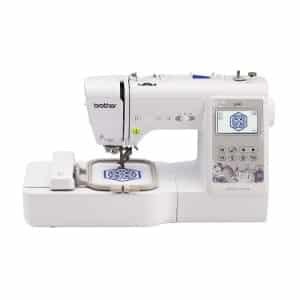 They have also used it to sew through different layers of heavy fabrics along with a heavy weight stabilizer, which does mean that you get a ton of sewing power with the Stylist 9960. You would likely also be pleased with all the different pressure feet you get with this machine, which would make things easier for you while offering a lot of versatility. Talking about versatility, you get a great number of stitches for different purposes, and there are also different fonts that you can use for different projects. The automatic needle threader would take care of one of the most challenging tasks when embroidering or sewing, which is threading the machine. And it would do that real fast. You get pretty much everything you would with a high-end embroidery machine, but for a fraction of the price with the SINGER Quantum Stylist 9960. And as we mentioned in the Brother embroidery machines review – and what the many other embroidery sewing machine reviews it got talk about – the wide selection of stitches and availability of many different design stitches make it a great option for those that are after a very functional embroidery machine that they can buy without breaking the bank. It just can’t get any better than this! The Janome MB-4S 4 Needle Commercial is the ultimate embroidery powerhouse that anyone into serious professional embroidery work would absolutely love working with. However, it doesn’t come cheap, which is why you don’t see it at the top. It’s not something those doing embroidery work as a hobby or even on a small scale professionally would be able to afford. That said, if you CAN afford this machine and have a large scale business based on embroidery work, then it would probably be a mistake to not consider the MB-4S Commercial as your new embroidery partner. It has a remote control screen that allows you to work with over 65,000 colors. The same remote control screen can be used to power many different machines, which makes it so much economical and convenient for large businesses managing multiple machines. There’s a LED light for getting the most accurate results with your embroidery projects as you can. However, something that would make things so much more convenient for you is the automatic thread cutter, which can cut jump threads automatically even between letters, which can otherwise be very time-consuming. The dedicated bobbin winding motor can wind new bobbins for you even when the machine is doing its thing, which is a feature you would likely not find in other professional machines as well. It would really make a difference when it comes to the effectiveness of your embroidery work process. There’s another feature that allows you to use the machine without the controller, and comes with a decent amount of memory that lets you store up to 1.5 million stitches. 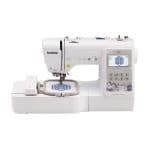 Finally, the “4 Needle” refers to the fact that Janome claims to have quadrupled what they offer with some of their finest embroidery machines with this one. The fact that it really makes professional, heavy duty embroidery work much more convenient, efficient and easy is definitely its biggest highlighting features. This is especially given that professional embroidery work can be very time-consuming and complicated, but it would be much better with the MB-4S Commercial. It hasn’t received any reviews yet due to its hefty price tag, but you can be sure that it’s the best embroidery machine you can buy if you don’t care about the price. If you’re looking for the best home embroidery machine that’s actually also the best sewing and embroidery machine combo, then the Brother SE600 will hit the spot perfectly for you. It has a large 37” color touchscreen display, which would make the usual sewing and embroidery considerably more involving and even fun. This actually also makes it a great sewing machine for kids, especially if they have got familiar with sewing and now you want to introduce them to embroidering. It comes with a 4” x 4” embroidery field, which isn’t very large by any means, but will serve you well all the same if you’re not into professional embroidering. You would also have a hoop, embroidery arm and foot along with the field. There are also some advanced embroidery features such as different thread colors, the ability to move the designs around on the screen, as well as being able to create letters on arcs. 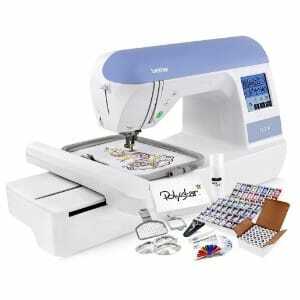 Similarly, the SE600 supports importing your own embroidery designs, which you can do so using the built-in USB port. There are also over a 100 stitches that include auto-sized buttons as well. 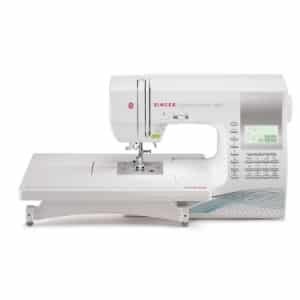 These all combine to offer a very functional embroidery setup for you, and that’s without getting into the fact that the SE600 could very turn out to be the best sewing and embroidery machine for those that are into both sewing and embroidering and wouldn’t like to have a significant compromise on any of them. There’s one thing all the sewing embroidery machine reviews it got clearly do. They explain well how the Brother SE600 manages to have some serious sewing might but while also being a pretty good embroidery machine at the same time. It’s also a sewing machine that embroiders names easily, which is again quite rare for a machine that comes with no compromise on the sewing front. The Brother PE550D is one of the more affordable embroidery machines that doesn’t compromise on the functionality. It comes with a 4” x 4” embroidery field, which would be enough for most embroiders that aren’t into large-scale professional embroidering. You would also have 125 built-in designs, including 45 unique built-in Disney designs. However, if you want to do an embroidery machine comparison, you will find that it compares very well to some of the much more expensive embroidery machines, as it too allows you to import your own designs. 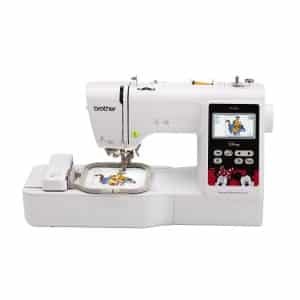 And as you can tell from all the Brother embroidery machine reviews it has received, its 3.2” LCD display is very impressive; it’s a color touchscreen display and allows you to get a very accurate idea of the designs before you start working on them. It also has some fairly advanced features that you may not expect at this price point, making it the best Brother embroidery machine for those on a budget. Finally, let us tell you that while it’s not the fastest embroidery machine out there, it’s very functional with things like the estimated time for your projects, a list of needed colors and other useful information being displayed on the screen. So while you don’t get a lot of speed as you do with some of the more advanced, expensive machines, you do get a much better level of ease of use which users new to embroidering will certainly appreciate. Most of the embroidery machines reviews the PE550D has gotten talk about how easy it is to use it right out of the box. The level of functionality you get is great for the price, and coupled with the ease of use, you can safely conclude that it’s one of the top embroidery machines priced well under $500. How We Chose the Best Embroidery Machine? Well, regardless of whether we are reviewing cheap sewing essentials or an expansive overlocker sewing machine, everything we mention is backed by solid research. And we have followed the same approach for choosing the best embroidery machine, or even the best embroidery sewing machine for that matter. We consider the kind of features the machine come with, the number of built-in designs as well as the ability to add your own designs, how powerful the machine is, the quality of work it helps you do and more. It’s important to note that these factors would differ quite a bit if you want to buy a different kind of machine, such as say a mechanical sewing machine. And of course, the price is another important factor, as setting up a sewing room for sewing and embroidering can be expensive, and not many may afford a very expensive machine, no matter the kind of sewing and embroidery machine reviews it may have gotten. However, we also have an expensive, high-end embroidery machine on our list, but that’s for those that are into large-scale professional embroidering and wouldn’t want to settle for anything that doesn’t serve their professional needs well. On a side note, if you’re into professional embroidering but struggle a bit with professional level sewing, then our sewing help might help you get better at it. And while we are at it, let us mention that we also have a pretty in-depth guide on starting an embroidery project here. There aren’t exactly different types of embroidery machines. In fact, there aren’t any of them that differ a lot from one another, but some of them do offer a different level of functionality. While some of them are almost entirely an embroidery machine, some others are more of a combination of a sewing and embroidery machine. You must remember that choosing an embroidery machine is fairly different than choosing something like a chainstitch sewing machine or a coverstitch sewing machine. You also may not find the kind of variety you would when buying a computerized sewing machine, or even the many different types of sewing tools. However, if you go through the reviews of all the embroidery machines we have reviewed above, you may find at least one that fits your needs exceptionally well. Similarly, just like how the case is with a Brother sewing machine or a Janome sewing machine, there are many different Brother and Janome embroidery machines as well. So apart from the different brands and the different levels of functionality, there aren’t really different types of embroidery machines out there. 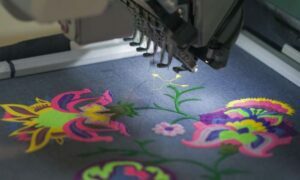 Why You Need the Best Embroidery Machine? Just having a great sewing chair or a very functional and advanced sewing desk wouldn’t cut it when it comes to the success of your embroidery projects. As quilters understand they need a great sewing machine for quilting to get the best results out of their quilting projects, even embroiders would need the best embroidery machine to be able to create stunning embroideries. The right embroidery machine would offer you a lot of versatility with respect to the type of projects you can work on. It would come with many different built-in designs, as well as allow you to add your own. It would also be very functional, making it easy for you to stay on top of the project and getting the kind of results you’re after. You may not find it to be a problem to work on large embroidery projects as well. A great embroidery machine would also work very efficiently, helping you save time and letting you crank out more embroidery projects than you would be able to using a mediocre machine. People that bought the machines we have reviewed as the best options also tell how impressed they are with their ease of use, which makes it easy to operate the machine for them and make the otherwise complicated process of embroidering surprisingly easy.